Pre heat your oven to 150 C.
Melt the butter in a saucepan and add the sugar. Remove from the heat. Finely chop the chocolate, and add this to the melted butter. Mix until it is smooth and all the chocolate has melted. Split the eggs, and add the egg yolks to the mixture. Leave the mixture to cool a little bit. Whisk the egg whites until they are stiff and carefully fold into the chocolate mix. It's a good idea to add a little egg white at a time, as that makes it easier not to beat out all the air you have worked to get into them. Grease a 24 cm cake tin and pour the mixture into it. Bake in the oven for about 50 minutes until baked. Take the cake out of the tin and leave it to cool down. It will sink a little bit in the middle. Make the chocolate glazing while the cake cools down. Melt the butter in a saucepan and add 90g icing sugar. Finely chop the chocolate and add to the melted sugar mix. Remove from the heat, and mix well until all the chocolate has melted. Split the eggs, and add the egg yolks to the chocolate mixture. Stir well. Leave the mixture to cool for a little while, then whisk the egg whites and add the remaining icing sugar into them when they are starting to get stiff. This should turn into a soft meringue, and it should hold soft peaks when you hold the whisk up. Carefully fold the meringue into the chocolate mixture. To decorate; whip the cream and place in the middle of the cake. 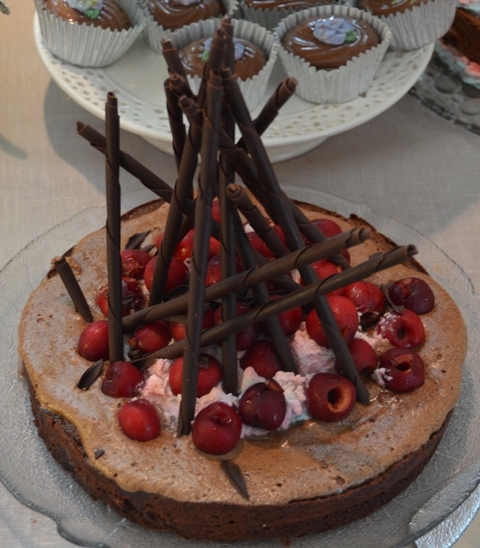 Add a handful of putted cherries, and finally add the chocolate decorations. Pour the chocolate glazing over the cake, and place in the freezer until you need it. It will keep for 8 weeks in the freezer and 4 to 5 days in the fridge after you have defrosted it. Allow 4 hour to defrost after removing from the freezer. Decorate while it is defrosting.